Following on from the success of last year’s Black Friday Sale, we are repeating our amazing one-day-only offer. 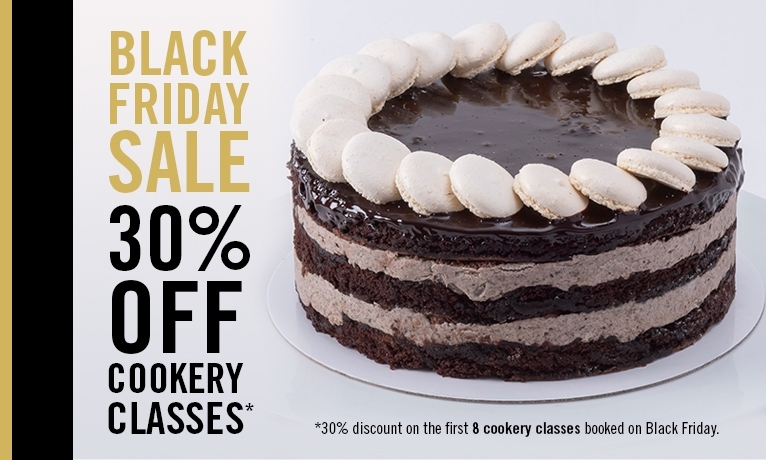 On Friday 23rd November, we’ll be offering a mammoth 30% discount on eight of our cookery school classes. The first eight customers to book a class will qualify for the discount. Last year, five of these sold between the offer opening at midnight and the time we opened for business! The remaining three discounted classes sold out during the day. Black Friday started in the United States as stores competed for customers out shopping on the final Friday of November – the day after Thanksgiving is a public holiday in many states. The idea of a pre-Christmas sale has caught on in the UK and many retail outlets are offering discounts to customers after high-ticket items. Happily, in order to take advantage of our offer, you don’t have to prepare yourself to brave the queues and November weather. Our eight discounted classes will be available online from 12:01 AM on Friday 23rd of November until the end of the day or the time that they are all sold. Any of our classes qualify for the discount – you just have to be one of the first eight people to apply. Check out our cookery school pages to see which one takes your fancy. For further information, please don’t hesitate to give us a call at the bakery on 01603 419506. A member of Team Macaron will be more than happy to answer your questions. What bargains are you hoping to bag this Black Friday? Let us know on Facebook and Twitter.